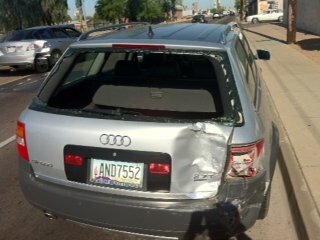 Sorry guys the car was taken by the Insurance Company. 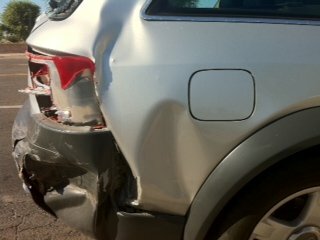 The damage is only to the passenger rear side. The liftgate and passenger rear quarterpanel. I know there are a lot of parts on these cars that are expensive and/or hard to get so I am considering selling the car as a parts car or parting it out. From what I've heard replacing all 4 airbags would cost close to what I'm looking for for the whole car. This is a Silver Allroad, black and grey leather interior, all seats are heated, the car is perfect except for where the Pathfinder slammed into it. Last edited by Knight1833; 08-24-2011 at 03:14 PM. Reason: Car gone. Wonder if your front springbags are OK? I need the left one, but if yours are still good then both of them will be alright. Only problem is that they need to be shipped to Europe. is this a 6MT or a Tip? Do you still have the air compressor? Is it original? Does it work well? I'm interested in ABS components if they are working properly? Sorry guys. The car was taken by the Insurance Company.